See Alanya by boat on a 5-hour sightseeing cruise, and explore the city’s historic highlights, ocean caves, and beaches. Enjoy music and drinks on deck as you pass the Red Tower and the Alanya Castle, then stop for a swim near Cleopatra Beach. 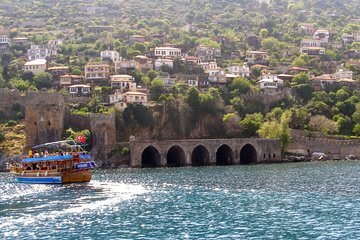 This 5-hour boat tour includes lunch and soft drinks, and it departs from a central location at Alanya harbor. Make your way to the Alanya harbor, where you’ll board a sightseeing boat for an easy-going cruise down the coast. Find a comfortable seat with a soft drink or a drink from the bar—alcoholic drinks are available for purchase—or head to an open upper deck that’s perfect for sunbathing. The crew will point out some of the sites you pass along the way, including the Red Tower, the Old Shipyard, and Alanya Castle, whose medieval fortifications have watched over the coast since the 13th century. Try to spot sea turtles and dolphins in the water, and peek into three of Alanya’s coastal caves: see Pirate’s Cave, Lover’s Cave, and Phosphorus Cave, where rock formations meet bright blue water. Cool off with a swim near Cleopatra Beach, then return to the boat for a lunch of grilled chicken, spaghetti, and salad before heading back towards Alanya harbor. This 5-hour boat cruise concludes at the original departure point.